Andrew Jackson Presidential Dollars will enter circulation Thursday, August 14. 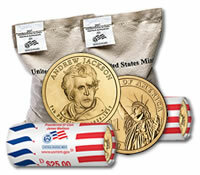 On the same day at 12:00 noon, Bags and Rolls of the $1 coins will be available directly from the United States Mint. While nearly one billion Presidential coins were minted in 2007, finding them in circulation or exchanging for them at banks is often a challenging task. That holds true for this year’s coins as well. Although the U.S. Mint charges a premium, purchasing $1 coins through their secure website is at least doable. The Mint offers the presidential $1 coins in 250-coin bags and 25-coin rolls that may be purchased with either the Philadelphia, “P”, or Denver, “D”, mint mark. Later this year on Nov. 13, the fourth and final Presidential $1 coin for 2008 honoring Martin Van Buren will be released. Already launched this year were coins celebrating James Monroe, and John Quincy Adams. The first four Presidential Dollars issued in 2007 had the images of George Washington, John Adams, Thomas Jefferson and James Madison. Orders may also be placed using the Mint’s toll free number 1-800-USA-MINT (872-6468). Hearing- and speech-impaired customers may place orders and inquiries through TTY at 1-888-321-MINT (6468), Monday through Friday from 8:30 a.m. to 5:00 p.m. (ET). I have quite a few Andrew Jacksons with extra letters on the edge here and there are theses rare? this coin? It is gold .or mint? i have a new looking andrew jackson gold coin that have andrew face on one side and engave 1829-1837 and us woman on the other side. An i wanted to know how much this coin worthy.